The #SweatworkingWeek Fit Fest originally scheduled for 1/19 is now rescheduled for Saturday, February 2nd! See below for updated information. Twice a year, we put our heads together to create a schedule that entices Chicagoans to try new things and meet new people, all while working out across the city. Each time we host #SweatworkingWeek, it changes, it evolves. This – the sixth edition – is no different. 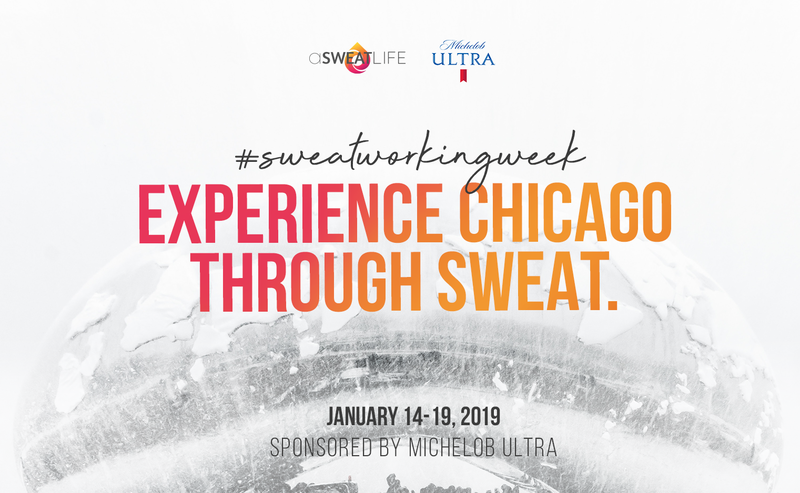 January 14-19, you’ll experience a true celebration of Chicago’s culture through the lens of sweat. This time around, we worked with some gems within the city – museums, attractions, monuments, and, yes, studios – to create a schedule that will make it easy to try new things and meet new people. And each workout will have a special reminder of why we live here and what’s here to to explore. Plus, our friends at Michelob ULTRA will be there throughout the week to give you a post-workout refreshment to celebrate your amazing effort. ULTRA strives to celebrate the individuals that live an active and balanced lifestyle — those who live a full life, filled with friends, good health and fun. Mon. Jan. 14 Tues. Jan 15 Wed. Jan. 16 Thurs. This group LIFT is circuit based training with both compound strength elements and interval conditioning while having a functional approach. You’ll concentrate on performing exercises correctly and while working hard in a safe environment. This elevated strength-training gym makes sure you’re COACHED during your LIFT! And the best part? You’ll be some of the very first people to try this spot while being coached by Josh Siroko, Chad Driscoll, and Pete Tamulewicz. At aSweatLife, we believe that wellness is for everyone and that wellness should be WELCOMING for everyone. And so, we think inclusion is a behavior that we can learn from each other in a lot of ways – from making new friends as adults to teaching people, and from leaving our neighborhoods to showcasing the wellness brands that are doing INTERESTING things. On this panel, we’ll talk about statistics re: where most studios are vs. where communities need wellness the most. We’ll talk about race/gender/affluence. We’ll talk about actionable solutions on the macro level vs. on the micro level. How do I act more inclusively in a fitness environment every day? How do I try new things and meet new people more frequently? How can gyms/studio owners create businesses in places where they’re NEEDED and wanted? This panel will be moderated by Nikki Desai from aSweatLife’s team. 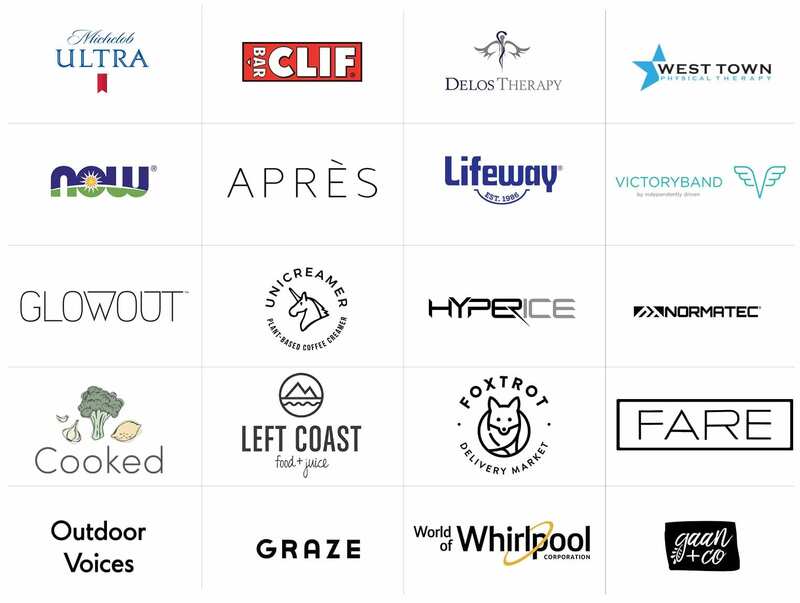 How much does it cost: it will be TOTALLY FREE thanks to sponsorship from CLIF Bar. Take on feats on monumental strength! CPG’s signature Primal Strength classes focus on lifting heavy things and developing full-body stability and power. This 60-minute combo class includes a thorough joint-mobility warm-up, hands-on skill development, and an expert blend of kettlebell strength exercises. Don’t let the name fool you, this class still delivers plenty of endurance to ensure maximum fat-burning, muscle-building results. You’ll also hone two keystone exercises: the swing and the getup. CPG will show you the exact technique to maximize safety AND results in our training program. You’ll be exposed to a variety of mobility and core exercises to build a strong foundation. The goal is for you to feel totally confident before advancing to Primal Strength and KB Flow classes! In their signature Alive class, you’ll experience a candlelit, vinyasa-inspired flow set to an expertly crafted playlist, turned up loud to help you feel all the feels. Expect strong poses, long holds, and thoughtfully slow transitions. Each class will include intentional breathwork and soulful guidance to help you go beyond the mind and come alive within. Alive is designed to awaken your soul while also challenging your body. Class is heated to a warm 80-85 degrees unless noted in the schedule. On the evening of Tuesday January 15, we’ll combine a local group we love with a museum you’ll want to run back to. We’ll take on a run with Despite the Dark that starts and finishes at The Museum of Contemporary Art Chicago. You’ll have access to tour the exhibits at the museum and your gear will be safely checked in a private room at the museum. And to kick off your run, Free Mvmt Shop gets you ready and on your feet with a quick Love & Hip Hop dance break. At this special #SweatworkingWeek breakfast-and-learn, we’ll teach you how to start your day off on the right foot: by creating a morning routine that’s infused with optimism. We’ll share the power of a morning routine and how you can practice optimism as a tool to fight against stress, bad news, and tough times. We’ll put it all together by breaking down the morning routines of team aSweatLife and leading a fun mix-and-match activity to help you have the best morning ever. This inspirational morning will take place at evolveHer, and we’ll fill your bellies with nutritious breakfasts and coffee to power your day. Known for its diverse training philosophy, focusing on athletic performance, lifestyle, and personal training, On Your Mark Coaching + Training opened its newest gorgeous training space on the West Side. This class will be an OYM mash-up; Kickboxing, performance and strength (20 minutes of each). On Thursday, you’ll see a takeover from RUNAWAY Fitness, the new entrant to the Chicago Fitness scene that will fuse all of the things you’ll see throughout the week: art, music, and – of course – sweat. You’ll be able to try out this new studio built for you, runners. And remember, whether you’re considering running your first mile or you’ve run an ultramarathon, YOU are a runner. 6 am and 7:10 am: You’ll get a taste of this brand new gym and its proprietary training style, AMP (Adaptive Musculoskeletal Periodization), created to help you reach running goals while still being able to mix and match your classes. 2 pm-4 pm, #TrainersConnect: For this mid-day break, trainers will take over RUNAWAY for our monthly trainer-focused event, #TrainersConnect. Not only will trainers get to try this new gym’s proprietary training style AMP, they’ll also get their own workshop! Erin Conroy, Doctor of Physical Therapy and owner of West Town PT will be on-site with injury prevention tips and tricks and to answer any questions you might have. 5:30 pm and 6:40 pm: You’ll get a taste of this brand new gym and its proprietary training style AMP, (Adaptive Musculoskeletal Periodization), created to help you reach running goals while still being able to mix and match your classes. On Friday Morning, we’re bringing our friends from the Vixen Workout all the way from Miami to SPiN Chicago for a morning dance party followed by some light ping pong action. The Vixen Workout is a dance fitness format that uses commercial choreography, killer music remixes, and stage lighting so you can experience yourself as a performer. (Basically, you get to pretend you’re opening for the VMA’s, and perform the moves you see by your favorite artists.) The mission is to give a new edge to pop culture by merging dance, fashion, music, and fitness. The classes create an environment where you can experience an emotional release, mind-body connection, and a sense of community while getting an insanely fun workout. We’ll host this workout at THE home for ping pong, SPiN. Join us at the iconic building on the Chicago river where the World of Whirlpool makes its home for sharing its vast stores of knowledge. You can expect to learn life hacks for cooking quickly and eating healthier. You’ll also eat delicious food from the World of Whirlpool’s Culinary team including the beloved Chef Alia Dalal (plant-based options will be available, and please let us know any dietary restrictions in advance!). Join us at the house that creativity built – The iO Theater. We’ll take on a workout with SHRED415, followed by a totally approachable improv workshop. No experience is necessary for either. From SHRED415, you’ll take on a workout that fuses their studio style with movements you can do anywhere. We’ll use resistance bands to amp it up and you can count on music from the DJ Firm to make it even better. From The iO Theater, you can expect an improv workshop that pushes you just comfortably outside of your comfort zone. This will be approachable for beginners, but fun for anyone who has taken an class in the past and wants to expose a friend to it! We’re taking out Thalia Hall for a fitness festival to wrap up the week. The hall was deemed a historical landmark in 1989 and today you can find comedy shows, The Pilsen Yoga Tribe, concerts, weddings and so much more in the great hall. Within the same walls, top-rated restaurants like Dusek’s, Tack Room and Punch House all call it home. Let the music amp you up as the DJ Firm performs alongside a live drummer for this boxing and conditioning session led by Midtown Athletic Club’s Julian Collins Sr. You’ll be challenged with combos or jab, cross, hook, and uppercut, but you’ll also find yourself sweating as you get your heart rate WAY UP with conditioning drills. And because Julian is an athlete who treats boxing like a sport, you’ll get a chance to feel like the undisputed champ too. This is the perfect session to kick off the festival. Tanya Lozano: You’ll feel your hips come to life with a a combo from Tanya. This mini class will make you want to dance at HealthyHood every day. More about Ballet Burn: Hold the classical music in this fist pumping, turned out twist on a traditional ballet/floor barre technique that combines cardio with grace and grit. MVFitness will have you leaving class feeling like a true Pop Star, without needing to be a dancer. Come as you are and be ready to flip that hair like Britney. We’ll end the day with an upbeat yoga flow paired up with a band that has roots in Chicago and wings in fun – the Lowdown Brass Band (which you should book for your parties, events and honestly, your Friday nights). You’ll be led by Jenny Finkel, one of the most upbeat (and hilarious) yogis we know; she’ll bring her sense of whimsy and rhythm to a flow like you’ve never done before. Don’t know how yoga fits with an eight-piece band? Guess you’ll have to be there to see it happen.